APRIL 7, 2013 IS DIVINE MERCY SUNDAY! (474) "In the evening, when I was in my cell, I saw an Angel, the executor of divine wrath. He was clothed in a dazzling robe, his face gloriously bright, a cloud beneath his feet. From the cloud, bolts of thunder and flashes of lightning were springing into his hands; and from his hand they were going forth, and only then were they striking the earth. When I saw this sign of divine wrath which was about to strike the earth...I began to implore the Angel to hold off for a few moments, and the world would do penance. But my plea was a mere nothing in the face of the divine anger. Just then I saw the Most Holy Trinity. The greatness of Its majesty pierced me deeply, and I did not dare to repeat my entreaties. At that very moment I felt in my soul the power of Jesus' grace, which dwells in my soul. When I became conscious of this grace, I was instantly snatched up before the Throne of God. Oh, how great is our Lord and God and how incomprehensible His holiness! I will make no attempt to describe this greatness, because before long we shall all see Him as He is. I found myself pleading with God for the world with words heard interiorly. As I was praying in this manner, I saw the Angel's helplessness; he could not carry out the just punishment which was rightly due for sins. Never before had I prayed with such inner power as I did then. (475) The words with which I entreated God are these:"Eternal Father, I offer You the Body and Blood, Soul and Divinity of Your dearly beloved Son, our Lord Jesus Christ, for our sins and those of the whole world; for the sake of His sorrowful Passion, have mercy on us. You may choose to pray the chaplet on Rosary beads. 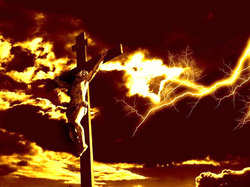 in atonement for our sins and those of the whole world."